MSBC is a one stop solution for textile technology and machinery, giving end to end technology, installation and after sales support. We have world renowned principals with globally experienced team having over 500 installations across Pakistan & India. 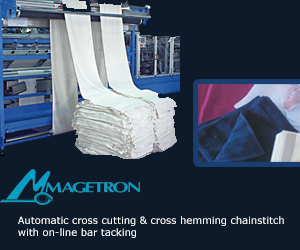 We are the only company in Pakistan who provide a complete Cut, Sew and Finish Automation in Home Textile Industry and complete machinery solution for Carpet manufacturing. We deal in focussed business vectors such as Apparel, Home & Floor Furnishing from Fibre &Yarn Processing, Fabric Dyeing and Finishing, Cut, Sew, Material Handling, Folding, Packing and Warehousing. MSBC operates in India, Pakistan, Bangladesh and Middle East markets. In our first 5 years, we grew with almost double sales revenue compared to previous year sales revenue; and from 2016 onwards, our sales has been growing with 40% YOY increase in sales revenue. We have been getting very good response from the Pakistani Home Textile Industry and we have already installed new Cut & Sew Automation in various major Home Textile Manufacturing units. Some of customers from Pakistan & India are Sadaqat, Gohar, M.K. Sons,Welspun, Sharadha, Trident, JVS, Asian, Kapoor Industries, Golden Group, Raj Overseas, Indocount, GHCL, DDecor, Himatsingka, Premier Fine Linen etc. We are always looking for solutions for our customers for improving inefficiencies and reducing operational costs. We bring in new agencies from time to time, looking at the changing needs of our customers to work ahead and reduce unforeseen concerns which our customers might come across in new product category or new product developed by them. We are guided and driven by a value system, in which we adhere to honest and ethical business practices, evaluate choices with a long term prospective, endeavour to deliver consistent results of desired quality with great pride and pleasure, to the entire satisfaction of our clients. This value system is the basic building block/ the foundation of our business philosophy and our astute professional strength. Our mission is to provide dedicated services of the highest quality in operational consulting and technology, with the focus entirely on client satisfaction. We are standing tall on the strong foundation of quality@speed in the Indian textile industry.